What’s black and sweet and savory and delicious at the same time? Answer: Aged Black Garlic, distributed by Frieda’s Specialty Produce to supermarkets and foodservice purveyors around the country. The latest “it” ingredient in culinary circles, Aged Black Garlic is a trendy yet simple new way to enjoy natural garlic with an amazing depth of flavor beyond raw or roasted garlic. Thing is, Black Garlic doesn’t really taste like garlic at all. It has a mouthwatering sweet and savory flavor that some compare to molasses, balsamic vinegar, soy sauce, Worcestershire sauce, or even licorice. While every palate is different, it can be said that Black Garlic possesses characteristics of Umami – a term used to describe the fifth human taste, for meaty and savory foods. 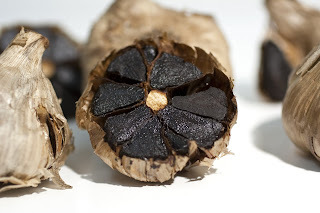 On the outside, Black Garlic looks like a dried brown head of garlic. But inside the papery skin you will find a chewy, dense black morsel of rich, complex flavors that are deliciously difficult to describe. What makes it black? Whole heads of high-quality garlic are aged for 1 month in a special high-heat fermentation process, naturally turning the cloves a deep, obsidian black. No preservatives or flavorings of any kind are added – just pure garlic. With all that flavor, you might think Black Garlic would be overpowering, but the truth is, it is subtle enough to eat straight, but intense enough to add a pop of palate-pleasing savory-sweet flavor to many simple dishes, from fish and poultry to pasta and appetizers. · Black Garlic ice cream!